Downsizing: What’s a naturalist to do? I looked around. She was right. If we were going to present this house for sale we’d have to lose (or at least hide) much of what was displayed on shelves and tabletops and hanging from ceilings and walls. Ours wasn’t the regular clutter. No, the realtor was looking at the huge bald faced hornet nest hanging from our ceiling, an ostrich egg on a pedestal, a bird nest glued to the fireplace brick, and a “curio” collection that looks more like a Museum of Natural History exhibit than a living room wall. And that was just the family room. That was three weeks ago. Since then, readying the house for sale and preparing to radically downsize (temporarily) to a two bedroom apartment has been an exercise in decision-making. 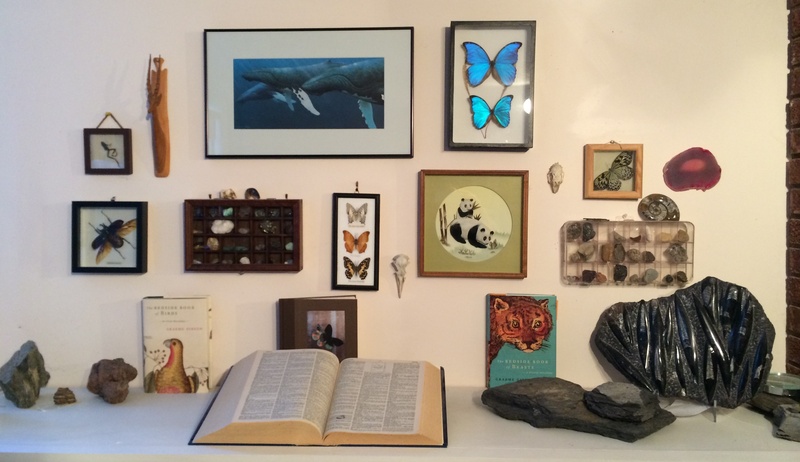 What do you do with a lifetime’s collection of natural objects — feathers and fossils, eggs and insects, bones and horns? Read more on my guest post over at the Canadian Science Writers’ Association blog: The Downsized Naturalist.